REMS GmbH & Co KG - Touch. Compare. Select. Promoting the mutual sale. The participation at many national and international trade fairs, the advertising in trade magazines and the direct mail marketing to the user is highly valued by trade outlets as sales-promotion measures. 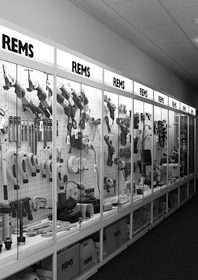 The attractive REMS product presentation system provides the trade outlet with an optimal presentation of the REMS products: Touch, compare, select. The individual stocking with REMS products is carried out with close cooperation between the REMS specialist advisors and the trade outlet. The online information system at www.rems.de offers extensive opportunities to find out information about the REMS group, the REMS products and their application possibilities and operation. Furthermore, the user has access to the complete online catalogue and detailed technical documentation, information about current trade fair appearances and addresses of REMS contracted customer service workshops, download opportunities of sales documentation, operating instructions, parts lists, product illustrations and product films, opportunities to order sales documentation in various languages for postal dispatch, e-mail addresses for REMS contacts and much more. 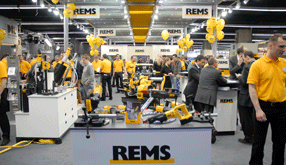 The REMS products are exhibited and demonstrated at many national and international trade fairs. 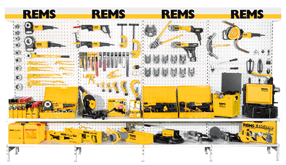 Practical for the trade, clear for the customers – the REMS product presentation system.